This sheet pan dinner is quick, easy & tastes great! just toss ingredients on cookie sheet, bake & dinner's ready in 30 with virtually no clean-up! Preheat oven to 400 degrees. Spray a rimmed cookie sheet with nonstick spray. 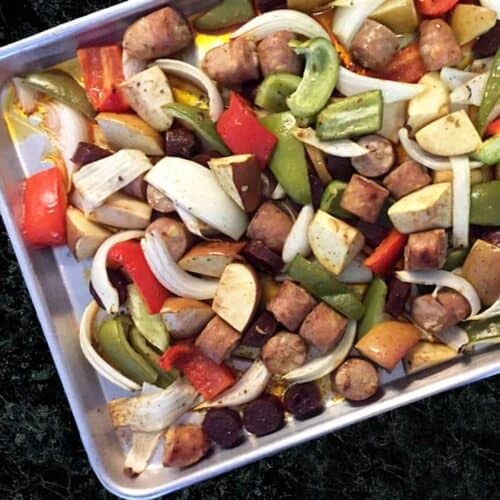 Place cut-up sausage, chorizo, onion, peppers, apple and potatoes, if using, on cookie sheet. Sprinkle with olive oil and Cajun seasoning and toss with hands until all is well coated.